Earlier this year, we teamed up with the Thomson Reuters Foundation and the International Anti-Corruption Conference to launch “Capture Corruption”, a global photo competition for the most powerful images of corruption and its devastating impact on lives around the world. Today, we’re revealing the winning selection. 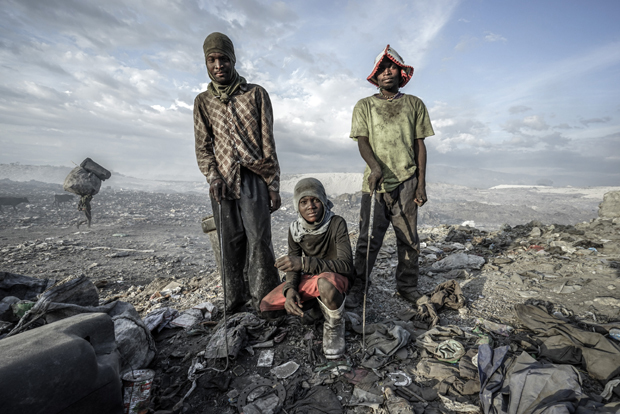 In first place in our 31+ category is Giles Clarke – selected from more than 1500 entries for his image of pollution and exploitation at a Haitian landfill. We asked Giles to tell us the story behind his winning image. Congratulations on winning the photo competition. Your photo shows a vast waste dump just outside Haiti’s capital city, Port au Prince. Why does this image sum up corruption for you? For me the image represents Haiti, and its desperate struggle to lift itself from the depths of misery and corruption that has plagued the country – by far the most corrupt in the Americas – for decades. The vast landfill is owned by the government and situated directly above the Plain Cul-De-Sac aquifer – the same water that provides drinking water for the poorest neighbourhoods of Port-Au-Prince. For me, this neglect by the Haitian government motivated my need to tell this story. There are around 2,000 people who make up this ‘dump community’. They don’t have medical help or clean water to wash in. There are mountains of dioxin-smoking waste that grow daily only yards from where families live in rough tin shacks. Your photo focuses on three workers at the landfill. What did you find out about the men and their experiences? They all have grave health issues – one look at their hands was enough to understand the problem. There is no running water and they live in dirt and smoke 24 hours a day. They all want the ability to work but without any programmes or jobs offered, this is their best option. Despite these alarming growing health issues related to the toxins being carelessly dumped, none of the solid waste disposal companies contracted by the government provide their workers with anything more than plastic gloves. What do you think needs to change to deal with the problem? Like many issues affecting developing countries, the key has to be educating the general public – in this case toward recycling education coupled with governmental funds diverted to recycling banks and equipment. Without those awareness programmes and the practical ability to recycle, supported by local government agencies, this issue will drag on for years. 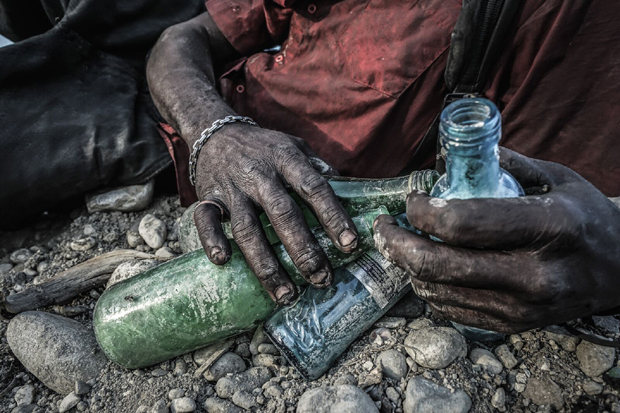 What motivates you to capture the effects of corruption in Haiti and around the world? My motivation is creating awareness to lessen the inequality gap and, ideally, help drive our political leaders toward creating a fairer and more sustainable future. Corruption is driven by greed – a terrible reality for many less fortunate people and a blight on our common humanity. Sometimes, unfortunately, I feel we almost need to publicly shame these people into action.